1. An attractive workstation, the Hi-Hi-Lo features a compact form that is ideal for any work area. 2. 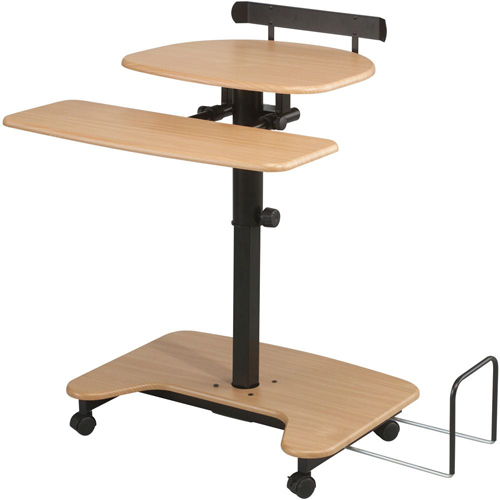 Height adjustable from 31 1/4" to 39 1/4" for use as a sit down or stand up workstation. 3. Keyboard shelf can be adjusted inward and outward. 4. Included adjustable CPU holder can be mounted on either side. 5. Monitor shelf includes a rail, and the bottom shelf can be used to store a printer. 6. Frame is black powder-coated steel and the shelves are scratch-resistant teak laminate. 7. Four 2" casters (two locking) are included for easy mobility.